Yum team member, Chrissy, introduced us to this hummus, based on a recipe from Cooking Classy. We use it as a spread for veggie tostadas (recipe coming soon!) and love it as a dip for fresh cut veggies. If you are feeling ambitious and have extra time, you can roast your own red bell peppers. We tested the recipe with jarred roasted red peppers and found the results to be just as delicious. The jarred peppers do add a bit more moisture to your hummus so make sure you drain off any extra liquid from the peppers. 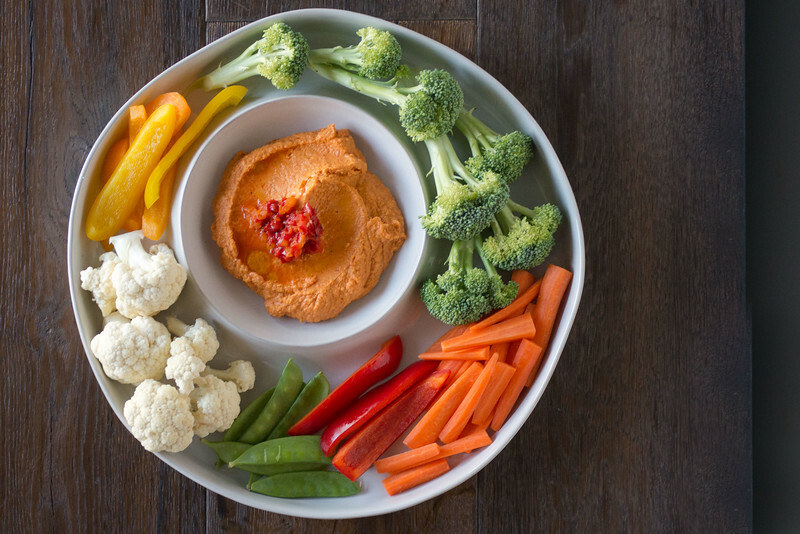 This hummus looks very pretty served with some finely chopped roasted red pepper, parsley, and a drizzle of olive oil to garnish the top. For additional spice, sprinkle with a little crushed red pepper flakes! Add chick peas, lemon juice, tahini, garlic, salt, and cumin to a food processor. Pulse about 2 minutes then scrape down the sides and bottom of the food processor. Add olive oil and three-quarters of the chopped roasted red peppers, reserving one-quarter of the peppers for garnish. Scoop into a serving dish, make a shallow well in the middle and add the remaining chopped roasted red pepper.